We offer kid and pet friendly upholstery cleaning to League City, Kemah, Friendswood, Pearland, Seabrook, Dickinson, Clear Lake, Webster and the Houston Metro Area. Here are a few simple guidelines to help extend the longevity of your furniture’s upholstery. Sun light can fade the colors of your furniture’s upholstery and also deteriorate/damage the fabric. To minimize sunlight damage and fading, try to rearrange your furniture around the room a few times a year. This also helps prevent your flooring from fade marks, lines, or shadows. 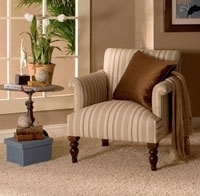 Vacuum or brush your upholstery when you vacuum or sweep your flooring. Frequent vacuuming is essential to prevent overall soiling. Turn or rotate your cushions during the periodic cleaning for even wear patterns. As with carpet care, quickly cleaning up a spill is crucial- blot spills immediately. Contact Scientific Cleaning and Restoration for additional spot cleaning tips! If your furniture’s upholstery has reached an overall soiling condition, contact us to schedule a professional upholstery cleaning. Inspection and evaluation: We first evaluate your upholstery, identify the fabric and fabric care specifications, and discuss what results you can expect. Vacuuming: Next, we vacuum to lift and remove dry soil from the upholstery. Pre-test: We perform a pre-test in a small inconspicuous area. Upholstery Cleaning: We perform the upholstery cleaning per the fabric care specifications. Accelerated Drying: “Turbo” air movers are used to shorten dry time. Protect (optional): If the fabric is compatible, we apply Scotchgard fabric protector. Post-inspection: This ensures your upholstery is cleaned to your satisfaction and all belongings are in their proper place.